Cleaning refrigerated warehouses at sub-zero temperatures of down to -36°C. Cleaning refrigerated warehouses with our certified cleaning procedure. The finned heat exchangers in the refrigerated warehouse area can be cleaned in an environmentally-compatible manner with our patented JetMaster procedure. In addition to significant energy savings, additional hygienic goods relocation areas are also created. Dirt gathers quickly on the floors of refrigerated warehouses due to the transportation of goods with the fork-lift truck and pallet truck. Pallets bearing the refrigerated goods need to be transported into the refrigerated warehouse from outside. There is no way to prevent dirt on the wheels of the fork-lift truck. This dirt freezes solid and accumulates, and therefore needs to be removed. Naturally, it is not possible to clean with water at sub-zero temperatures of down to 30°C, if the temperature inside the refrigerated warehouse is not raised above 0°C, and this would involve removing the refrigerated goods beforehand. If there are several refrigerated warehouses, the refrigerated goods can simply be moved to another storage room. If the cooling system is deactivated, the refrigerated warehouse can be brought to a temperature of 0°C to allow conventional cleaning with water and cleaning agents. However the act of lowering the refrigerated warehouse temperature again after cleaning alone generates significant costs, plus time is required to relocate the refrigerated goods. It becomes even more difficult if there is only one refrigerated warehouse. In this case a refrigerated container needs to be leased for the cleaning period, and this too needs to be brought to the right temperature before the refrigerated goods can be placed inside. After the soiled refrigerated warehouse has been cleaned, its temperature needs to be lowered again before goods can be placed inside. 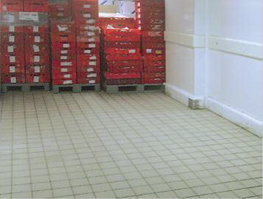 The total costs for cleaning a small refrigerated warehouse with a floor space of approx. 50 sqm including manpower and leasing costs for the refrigerated container can add up to more than a medium-sized four-digit sum. In cooperation with its affiliated company mycon GmbH, Kipp Umwelttechnik GmbH has developed a special cleaner that is safe for use with food and also achieves excellent cleaning results even at sub-zero temperatures of at least -30°C. 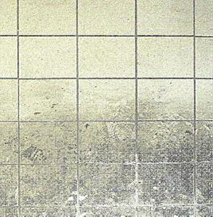 It is possible to clean at even lower temperatures with certain applications. The refrigerated goods can remain in the refrigerated warehouse during the cleaning work. The cleaning procedure itself is a carefully detailed and patent-pending procedure which has precisely specified consumption quantities. Knock-on effects, for instance the creation of explosive mixes at temperatures above 0°C when the refrigerated warehouse is switched off are completely ruled out. Kipp Umwelttechnik GmbH not only supplies effective cleaning equipment but also an entire concept that is continuously monitored to ensure that the stored refrigerated goods are not damaged. Every cleaning procedure is documented and the data saved. Kipp Umwelttechnik GmbH commissioned the Hannover-based company Wessling GmbH to examine and certify its cleaning agents and procedures. Wessling has a workforce of around 1200 employees and is one of the leading companies in the field of consulting, analysis and testing on the market. Wessling tested the procedure developed by Kipp Umwelttechnik GmbH and its cleaning agents, which were also developed by Kipp Umwelttechnik GmbH and mycon GmbH, and classified them as safe for use in the food industry; they were approved in conjunction with the operating instructions issued by Kipp Umwelttechnik GmbH. This means that every customer in the food industry can have a sense of security and verify to their own customers and public authorities that Kipp Umwelttechnik GmbH, or one of its partner companies cleaned the refrigerated warehouse in compliance with all safety and food-rated requirements.